Lawn weeds are opportunistic, unwanted plants that compete with lawn grass. Poor environmental conditions that hamper the growth of grass open the door to a wide variety of weeds. Louisiana lawn weeds are either broad-leaf or grass-like and grow primarily during the spring and summer. The best way to prevent lawn weeds is to have a healthy, full lawn that can successfully out compete the weed invaders. Barnyardgrass (Echinochloa crusgalli) is a grass-like, summer annual with green leaves. Seed spreads Barnyardgrass in early summer and once initially established, it forms secondary tillers that creep over the surface forming secondary roots. This weed is found in moist, nutrient-rich soil and can be prevented by regular mowing and hand pulling. Bermudagrass (Cynoden dactylon) is a grass-like, creeping perennial that spreads quickly with stolons and rhizomes. Bermudagrass is grown as a desired turfgrass in the Southeastern United States, but in Louisiana is primarily considered an invasive plant that can out compete more desired turfgrasses. A combination of herbicides and physical removal usually keeps Bermudagrass growth in check. Buckhorn plantain (Plantago lanceolata) is a broadleaf, perennial with 1 inch wide leaves extending vertically from the central stem. This weed spreads by both seeds and shoots and grows throughout late summer. Mowing to a shorter height will prevent seed head formation. Established weeds should be hand-pulled from the root. 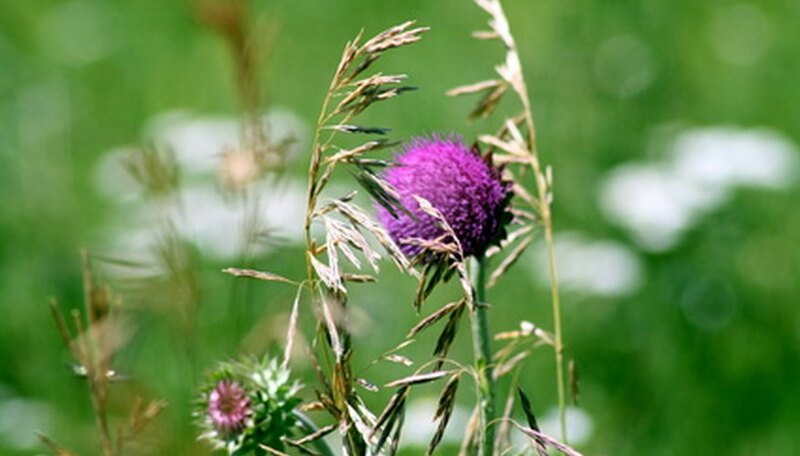 Bull thistle (Cirsium vulgare) is a broadleaf, biennial that grows throughout the summer. Dark green, lobbed leaves extended outward from the taproot with sharp, lacerated edges. Pink and purple flowers are present from June to October. Spraying a post-emergent herbicide directly on the weed foliage is an effective way to control growth and kill the weeds. Sandbur (Cenchrus longispinus) is a grass-like, summer annual that forms thick clumps and low growing, green leaves. Sandburs spread by rooting at nodes and by the dispersal of bur-ridden seeds that easily stick onto passing animals. Sandbur thrives in sandy, thin stands of turfgrass and may be physically removed or sprayed with a post-emergent herbicide. What are the Common Lawn Weeds in North Texas?